DOCTOR WHO: Series 8 - You Will Survive | Warped Factor - Words in the Key of Geek. Series 8 and the arrival of a new Doctor has certainly divided Doctor Who fandom in a way that's not been seen since, um, Series 5 and the arrival of a new Doctor! Tony Fyler addresses the issue. There’s a group on Facebook that was set up in the States when the Tea Party was at its loudest and maddest, making up nonsense about the latest President. The group counters the absurdist claims and is called We Survived George W Bush, You Will Survive Obama. Since the arrival of Peter Capaldi’s Doctor, there’s felt like that kind of split in Doctor Who fandom – those who adored the previous incumbent claiming it’s the end of the world, the end of the show, or the end of their affiliation to it, because the new incumbent isn’t to their taste, and those who love the new incumbent scratching their heads, trying to work out what, exactly, those who don’t agree with them find it impossible to love about the new incarnation and the new tone of the show. Of course, everyone has their Doctor, and fandom is not a static or a solid thing, it’s a fluid continuum. It connects people who might otherwise not give each other the time of day, and it makes us all shut up for a while, united by nothing more remarkable than a TV show. We watch, we absorb, we find our opinions and we add them to the pile. Some of us are lucky enough to have something like WarpedFactor on which to share those opinions. We all have comments sections these days, and gosh, aren’t we important? It’s genuinely important to remember though that this Chicken Little Syndrome, which claims the sky is falling because the show has not remained the same, is not a new phenomenon. When Jon Pertwee’s Third Doctor regenerated into Tom Baker’s Fourth, there were plenty of fans who howled that the show was over, that their Doctor was the best imaginable. Seven years later, a huge number of fans thought the show had run its course because a generation of fans had known no other Doctor but the toothy, quixotic Baker. There have always been people who tune in for the space of a particular Doctor, or two, or three, and then tune out again, or lose touch with the fundamental essence of the show and move on. And there have always been people who treat Doctor Who like a football team – there are good seasons and less good seasons, good Doctors and less good Doctors, good showrunners and less good. But those devotees support the show through it all. They survive some seasons and Doctors, and thrill at others. Speaking personally, I thrilled through Peter Davison and Colin Baker, and survived Sylvester McCoy and the Cartmel Master Plan. I thrilled through Eccleston and Tennant, and survived Matt Smith. And now I personally am thrilling to Capaldi. Plenty of others thrilled though Smith, and apparently feel themselves so vital to the longevity of the show that their disapproval of Capaldi equates to a drop in standards, or the end of the show’s meteoric success. 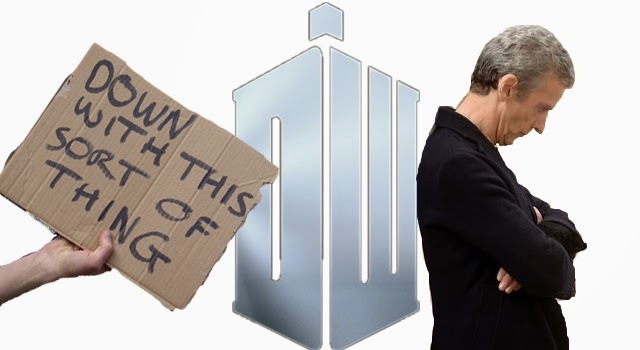 If you think that after four episodes, you know enough about the new Doctor, the new tone, or the new direction the showrunner is taking to dismiss it, by all means, feel free to stop watching. There’s nothing special about that decision, and if in the future the show takes a direction you enjoy more, it will still be there to welcome back your eyeballs and your commitment. If you’ve been bitten by the magic of the show in any of its iterations though, if the fundamental ethos and the core of it have moved you, or opened your eyes, or made you sigh or punch the air, then sit still, keep watching and prepare to survive your way through the Twelfth Doctor, because if the show has truly bitten you, there’s no escape from the breadth of its vision, the scope of its dream. Every now and then, if you’re open to it, Capaldi will surprise you, just as every now and then, McCoy surprised me with a Remembrance of the Daleks, or a Happiness Patrol or a Survival. Smith too, every now and then, gave those of us who survived him an episode of shining brilliance – for me, The God Complex, The Snowmen, and The Time of the Angels/Flesh and Stone qualify for that description. If Capaldi’s Doctor hasn’t moved you yet, either feel free to tune him out, or sit still and prepare to survive him. But don’t make the mistake of equating your dislike with a drop in standards – it just makes you look like you don’t understand the show at all.